On Thanksgiving, my parents will set up chairs for the usual crowd: immediate family, my aunt, a handful of cousins. And if this year is like most others, there will also be an extra place or two set for the annual itinerants: an out-of-town visitor, a family friend without other plans, a college roommate far from home. My family’s Thanksgiving table has always expanded to embrace all comers, occasionally stretching out of the dining room and across the living room. It is a spirit of cheerful hospitality that, I have recently learned, has at least some of its roots in a far less joyous Thanksgiving weekend more than 70 years ago. On November 28, 1942, my great-grandmother Mary said farewell to four of her five sons as they headed from Wilmington to Boston. Henry, a private in the Army Air Corps, was home on leave, and his brothers James, Wilfred, and John were taking him out to celebrate. 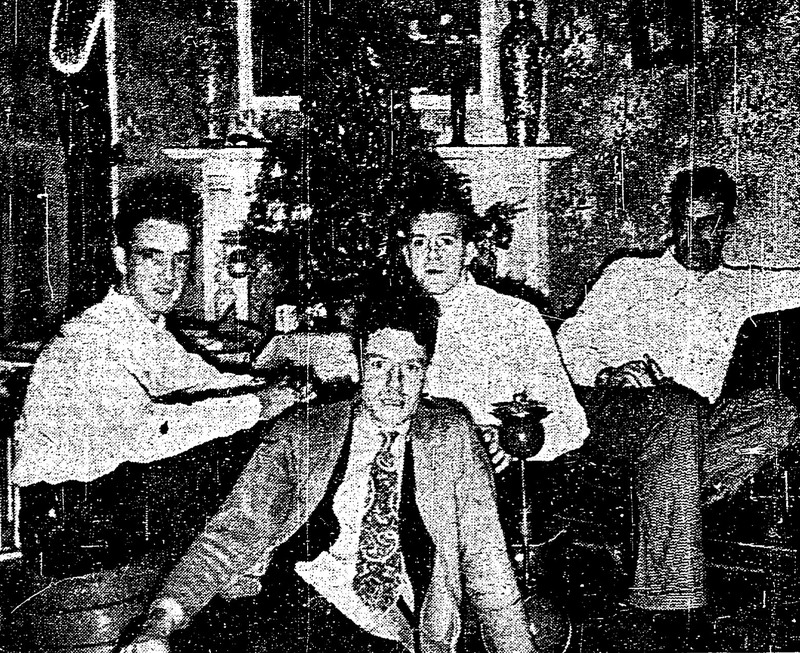 But at 2 the next morning, Mary got a heartbreaking phone call: A catastrophic fire had broken out at the Cocoanut Grove nightclub in downtown Boston, the spot her sons had chosen for their homecoming revelry. It soon became clear that the four brothers were among the nearly 500 people killed in the blaze. Mary was shattered by the deaths of her “fine boys,” as she described them to a Globe reporter days after the fire. In her grief, she took to her bed. She lived with her daughter Anna, who tended to her needs, and her grandchildren visited at her bedside, but she almost never left her room. Anna’s three children found themselves growing up in a house of perpetual mourning. To escape the gloom, they often walked up the street to the home of their aunt and uncle, my Nana and Grampy. Nana, too, grieved the loss of her brothers and was often sad and solemn. But she had a growing flock of children — six girls and a boy by 1950 — so the house was a lively place, full of cousins for Anna’s children to play with. In 1979, just days before another Thanksgiving, Grampy, who had long battled cancer, died. After the funeral, emotionally exhausted, Nana sat down in her living room with my mother. Should they go ahead with Thanksgiving? my mother asked. It was Anna’s children who helped Nana make up her mind. She remembered the sorrow her sister’s children lived with, and how they’d taken refuge among their cousins in that same living room. By then, she had 14 grandchildren, and she was determined her house wouldn’t become a place of sadness for them. Thanksgiving, Nana declared, was on. I was a toddler then and have no memories of that holiday. And until recently, our place in the story of the Cocoanut Grove fire was just another item in the constellation of family facts I have absorbed. Then, last year, there was a flurry of news stories commemorating the 70th anniversary of the fire. I began asking my mother and other family members what they knew about our connection to the event. What I learned is this: Over the decades since the tragedy, my family has translated the desperate grief of losing loved ones into an almost hereditary habit of taking joy in those who are still here, of opening our arms — and our dinner tables — in welcome. So on Thursday, this year’s crop of guests will pass the stuffing, share news, make jokes about the time my sister tried a new broccoli recipe. We will lift our glasses and toast. And we will most certainly give thanks. This essay originally ran in The Boston Globe Magazine on November 24, 2013.